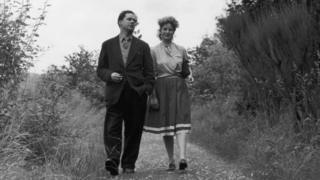 A 95-year-old woman who worked as a code breaker during World War Two and knew the poet Dylan Thomas has won a High Court defamation ruling. Haydn Price, a media company director, tried to sue Gwendoline Watkins, from Swansea, after meeting her to discuss buying some photographs of the poet. Judge David Cook ruled that Mr Price, 50, had not made a "viable case". Mrs Watkins is the widow of poet Vernon Watkins and knew Thomas well, the court heard. The judge provided his decision in a written ruling following the High Court hearing in London. He ruled Mr Price, who lives in County Wicklow, Republic of Ireland, had made "incoherent claims" against Mrs Watkins. Mr Price met Mrs Watkins several years ago and his company "purported" to buy the copyright for a selection of photographs of Thomas, the judge said. Mr Price subsequently accused Mrs Watkins of "defamation and breach of wider obligations of confidence and trust". Mrs Watkins told the judge in a statement: "I deeply, deeply regret having had anything to do with Haydn Price."